Click Buy Now to purchase a copy of the book. PLEASE NOTE: Sales apply to US customers only. International customers, please email stanwood@sowersfield.com. This book began by answering questions. As a specialist on the national staff of the main line denomation for many years, a seminary faculty member teaching church planting at the master’s and doctoral levels, and as someone who successfully planted a church, I get asked a lot of questions about how to plant a church. Potential church planting pastors, current planting pastors, lay leaders, denominational and governance leaders and those who are just plain interested in watching the Great Commission in action want to know how to craft a vision. They want to know how to move from crafting a vision into building a church. Finally, they want to know how to replicate effective results and plant other new, healthy, robust churches. Many fine books have been written about how to plant a church. I am familiar with them, and as I know many of the authors, I have respect for much of the work that has been done on this topic. However, as I reviewed and read more of these books, I began to see gaps in the church planting literature. I believe these gaps are serious. This book, as I’ll explain more fully in a moment, is an attempt to address those gaps–to provide a more comprehensive, more holistic view of church planting. What’s wrong with the current church planting literature? But first, let’s look at the existing literature and those gaps. What are the gaps and why are they important? In the main, the books that exist on this topic focus on one of three areas: first, theological. This focus is a critical first step in any church planting endeavor. Developing and understanding a strong theological basis for why a church will be planted in a particular place at a particular time is important. Church planting requires a vision as well as energy; a paradigm as well as practice. Understanding how God’s call and blessing energize and sustain a church planting mission is crucial to effective planting. However, a theological book alone isn’t enough when questions about selecting and training lay leaders surface. Or when questions about financial support and administrative needs are pressing against the process. Or when a committee needs guidance on selecting a senior leader. In other words, to be effective, a book on church planting should supply a creditable theological paradigm as well as nuts-and-bolts information when those theological boots hit the ground. Second, sometimes the focus of existing books stems from an author who has experienced success in church planting and who wants to share the value of that experience. These books are interesting, often compelling, and they offer valuable insight into the church planting process. There’s nothing like watching a trailblazer. They are the ones who have successfully navigated through the treacherous landscape of the real world, and their experience feels like a template for others to use. However, the difficulty with books authored by the successful is that their success is often not replicable. Finding the same dynamics of place and people which contributed so profoundly to effectiveness for the trailblazer is all but impossible for others to copy. The unique characteristics of communities and governance, of spiritual gifts and energies that flowered in Biloxi may fall flat in Boston. Effective church planting involves being able to “read” cultures and to understand the full range of options that might be pursued in a particular time and place with a particular people. A highly usable book on church planing should expand the focus from a single trailblazer’s experience to a wide range of skills and talents that prove effective in a wide variety of church planting contexts. Finally, many church planting books (and other media options) are shaped as how-to manuals. Again, these books can be useful. The basic building blocks of starting an organization are fairly universal. Determining needs for decision-making, leadership, and responsibility can be spelled out. Even checklists that are geared for organizational development cycles can prove helpful. This literature, which ranges from a kind of “church- planting-for-dummies” mentality to sophisticated time-and-task driven software can concretize vision and provide various litmus tests for legitimacy. However, what this literature gains in universality it loses when particularity demands compromise, change, or constraint. How-to manuals are not strong on flexibility. Some of them focus on parts of the process, but not the whole process. They’re not big on agility, the need for immediate or long-term change, or what to do when the decision is to step backward, re- evaluate and course correct. A church planting guide that goes with the flow, that provides critical how-to standards while allowing for change and re-direction is a much more user-friendly (and realistic) tool. This book addresses the need to discuss all three areas: 1) a firm theological base; 2) appropriate case studies that reveal various aspects of church planting; and 3) a how-to manual that goes beyond checklists and calendars. The exercises and content invite the reader to explore theological strengths and beliefs and to see how leaders in the field of church planting succeeded. Furthermore, the exercises included open doors to new discoveries about how one’s beliefs shape the church plant plan. They are designed to help a team or committee come together about how to plant, when to plant, and where to plant a church. This book comes from creditable research using state-of-the-art social science methodology. Effective church planting clergy in seven major denominations was studied and the results show the contours of leadership and work that contribute to success in the church planting field. This data isn’t a pep talk or a hypothetical outline of best ideas, but it is a careful map that shows the traits, gifts, and behaviors of effective planters. This book is designed for anyone wanting to plant a church or anyone involved with someone who does. It is for mainline and evangelical Protestants; para-church organizations and others who are interested in planting a church. The exercises are open-ended; the content is shaped for all Christians who want to spread the Gospel. It is a guide for everyone. Finally, this book develops organically, at the rate questions and decisions normally arise in the process of church planting. In other words, it begins at the beginning and ends at the end. In between, organizations evolve, personalities combine, vision sharpens. 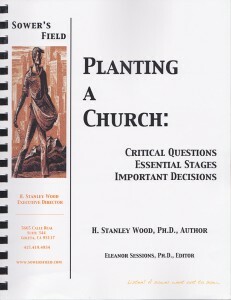 This book helps answer the questions and address the decisions as those processes normally arise in the course of church planting.